Lots of CEOs talk about innovation, but which companies are putting their money where their mouths are when it comes to driving real innovation? Today, the IP & Science business of Thomson Reuters answered that question with the release of its fourth annual Top 100 Global Innovators list. The annual study, which is the only purely quantitative ranking of innovation of its kind, recognizes the 100 most innovative organizations globally based on a series of financial and patent-related metrics. Beyond the list itself, which includes some names you’d expect (Apple, IBM, Google, IBM, Samsung) and some surprises (Blackberry, Huawei, NGK Spark Plug), the Top 100 Innovators report also contains a detailed analysis of company financials, the influence of governmental policies and industry trends. Japan Takes the Lead Among Global Innovators; U.S. Declines 27% Year-Over-Year: Asia is home to the largest share of Top 100 innovators for the first time this year, with 46 of the 100 companies hailing from that region. Of these, 39 are based in Japan, 4 in South Korea, 2 from Taiwan and, for the first time, a Chinese company (Huawei) has made the list. North America follows with 36, down from 46 last year, with 35 companies domiciled in the US and 1 in Canada. Europe contributed 18 honorees, with the largest representation coming from France (7), Switzerland (5) and Germany (4). The United Kingdom is noticeably absent from the Top 100 list again this year, despite aggressive tax legislation in the country designed to spur new innovation. Top Innovators Doubled Annual Revenue Growth Rate of S&P 500: Thomson Reuters Top 100 Global Innovators outperformed the S&P 500 for the fourth consecutive year, achieving year-over-year market cap weighted revenue growth of 12.6 percent, roughly double the 6.85 percent annual revenue growth generated by S&P 500 companies. 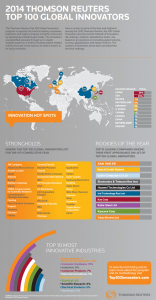 The 2014 Top 100 Global Innovators also generated US $3.69 trillion in revenue last year. And, they had an increase in R&D investment of more than double their NASDAQ counterparts; the Top 100 increased R&D spend by 16.9 percent, whereas NASDAQ’s R&D investment jumped by 8.18 percent and S&P 500 by only 3.97 percent. R&D Spending Growth Accelerates: The 100 organizations in the study spent a combined U.S. $208 trillion on R&D in 2013, the group outspent the constituents of S&P 500 at a rate of 4:1. 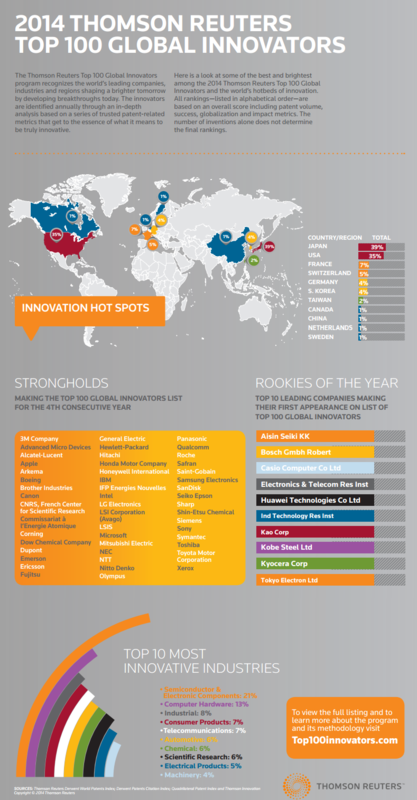 On a year-over-year basis, Top 100 Global Innovators increased their total R&D spending by nearly 17 percent. Smartphone Patent Wars Continue to Drive New Innovation: The intense competition in the smartphone space is on clear display in this year’s Top 100 Global Innovators list, with the major players in the smartphone patent wars present: Apple, Microsoft, Samsung, Google and BlackBerry. Semiconductor Firms Still Leading the Chase: The Semiconductor and Electronic Components industry continued to lead all other industry sectors in 2014, with 21 representative companies, a 9 percent decrease from the previous year, but still a 50 percent increase since the Top 100 program’s inception, when there were just 14 semiconductor companies on the list. Computer hardware was the next most prolific industry, with 13 companies, up 18% over the previous year. The Industrial sector contributed 8 companies to the Top 100 list, displacing the Automotive sector, which contributed 6 companies this year, down from 8 last year. Pharma Continues to Increase Presence in Top 100: For the second year in a row, a growing number of pharmaceutical companies, including Abbott Laboratories, Johnson & Johnson, Novartis and Roche, have cemented their presence on the Top 100 list by virtue of their strong global patent portfolios. This comes despite the Top 100 methodology favoring fast-moving, hyper-competitive industries such as semiconductors/electronic components and computer hardware, as opposed to pharma, which tends to have longer R&D cycles. To view the full Top 100 Innovators graphic, see blow, or click here.